Jack Tretton took the stage at Sony's E3 2008 press conference and proclaimed it "the year of the PS3." Reflecting on the oft-touted ten-year lifespan of the PS2, the underlying message seemed to be similar to what we heard from Sony in the past: Just wait, a little bit more. Sony dropped few big bombs during its press conference, which lasted an hour and a half, but did have plenty of details to reveal: just in case you missed something, we've got complete Cliff's Notes from Sony's presser for you after the jump. Fitting the theme of a gradual but ever-progressing transition for the PlayStation 3, Sony announced the first Greatest Hits collection for the console, older titles that will now sell for $30 in North America. The first of these will be Resistance: Fall of Man, Motorstorm, Warhawk, Call of Duty 3, Fight Night and Need For Speed: Carbon. The company also provided a launch window for LittleBigPlanet — previously pegged for September, the company now plans to release it in October. Sony also spent time on the PS2, which Tretton said is still alive and kicking. "In 2008, we're introducing more than 130 titles to PlayStation 2," he said. A new PS2 bundle, called the "Family Value Pack," is hitting North America in the fall, coming with LEGO Batman and Justice League: New Frontiers on DVD for $149. As concerns the PlayStation Network, Tretton mentioned the company's effort to ease user migration from PS2, part of which is giving all PlayStation users a single sign-in that can migrate from PSP to PS3 and PC. The other piece of big PSN news was the announcement of Ratchet & Clank: Quest For Booty, which is a shorter-length downloadable that Europeans will have the option of purchasing on disc. Tretton touched on Sony's long-awaited virtual world, Home, with little new information to report. "Your patience [for Home] will be more than rewarded," said Tretton said at E3 - meaning there's still no launch date in sight. However, the demo that was shown during Sony's press event looked, according to our own Crecente and McWhertor, much better than Home had previously looked. As a counterweight to Microsoft's announcement of a partnership with Netflix, Sony revealed that it, too, would be receiving downloadable movies through studio partnerships, including Warner, 20th Century Fox, Lionsgate, Disney, MGM and others. The cost is $15 to purchase, $6 to rent in HD, and $4 to rent in standard definition. The AVC-format videos downloaded to PS3 can also be transferred to the PSP via a USB cable, and the service was set to go live on the same day the announcement was made, July 15th. A new "Life With Playstation" channel was announced, set to launch in North America at the end of the month, said to bring the news, weather and more to your PlayStation 3. Finally, the PS3 did get a price drop — of sorts. Tretton announced a 80 GB PS3 "Core Pack" that'll go for $400 - "the same functionality of the 40 GB... with twice the storage," he said. 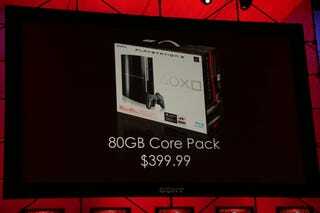 "This new 80 GB PS3 is perfectly suited for HD games, music, movies and more." On to PSP, a new bundle was announced, the $199 Ratchet and Clank: Size Matters pack, which comes with the game, National Treasure 2 on UMD, a 1GB memory stick and a voucher forEchochromeon PSP. The PSP is also getting several new titles: Sony showed Resistance: Retribution, in development by Sony's Bend Studio, along with LocoRoco 2, Patapon 2, NBA 09: Inside, Super Stardust Portable, Buzz! Master Quiz, and Midnight Club: Los Angeles Remix. The presser closed with the unveiling of MAG, the so-called "Massive Action Game" that may or may not be a SOCOM IP, promising battles for up to 256 players online at once. Does Survival Horror Really Still Exist?